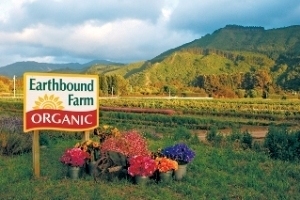 Earthbound Farms is the largest organic produce brand in the United States. Earthbound Farms was founded in California’s Carmel Valley in 1984 by Drew and Myra Goodman, young transplants from Manhattan, drawn to the natural beauty and richness of the land. They settled on a 2 1/2-acre raspberry farm and decided that doing the right thing meant committing to farming the land organically, producing food they wanted to eat themselves and would feel good about serving their families and friends. Their first crop was organic raspberries, which they sold at their roadside stand. They originally thought that they would live on the farms for a year or so. In 1986, they became the first company to successfully launch pre-washed, packaged salad for retail sale. Their mixed baby greens and spring mix started a salad revolution. Today gourmet salad greens and packaged salads are staples at most grocery stores. Earthbound Farms is credited with popularizing spring mix salads. The success of Earthbound Farms opened the door to organic food at big-name retailers like Costco, Wal-Mart, Safeway, and Albertsons. By 2003, Earthbound Farm’s line of organic salads, fruits and vegetables were available in 75% of US Grocery Stores. Earthbound Farms has become the country’s largest producer of organic produce and is committed to becoming a catalyst for positive change in our kitchens and environment. Today, research confirms the environmental and nutritional benefits of organic food. Sadly, only 3.5% of the food we eat and beverages we drink are certified organic. Earthbound Farms has received numerous awards and recognition for environmental sustainability. Myra Goodman has also published two organic cookbooks. Earthbound Farms is another story of two entrepreneurs who created a brand that has had a positive impact on society while making money. Earthbound Farms sales are estimated to exceed $460 million with earnings of $75 million before taxes, interest and depreciation. Do you buy organic produce when it is available?